RECRUITMENT UPDATE FOR HIV ENTEROPATHY TRIAL FROM ENTERA HEALTH - Entera Health, Inc.
CARY, NC (Business Wire November 12, 2013) – Entera Health, Inc. announced today that the number of patients enrolled into a study to evaluate the impact of EnteraGam™, a serum-derived bovine immunoglobulin/ protein isolate (SBI), on HIV-associated enteropathy has surpassed the midpoint of recruitment. The goal of the study is to evaluate the safety and efficacy of EnteraGam™, a prescription medical food indicated in patients with enteropathy (intestinal disorders) who, because of therapeutic or chronic medical needs, have limited or impaired capacity to ingest, digest, absorb, or metabolize ordinary foodstuffs or certain nutrients under physician supervision. More information for the study is available at www.clinicaltrials.gov (NCT01828593). Dr. David Asmuth, Professor of Medicine at the Division of Infectious and Immunologic Diseases, UC Davis Medical Center, serves as the Principal Investigator for the ground breaking study. Dr. Asmuth conducted an open-label trial examining the impact of SBI on restoration of mucosal immunity and gastrointestinal function in individuals with HIV enteropathy. SBI was noted to significantly increase intestinal mucosal CD4+ lymphocyte counts, improve duodenal function, and showed evidence of promoting intestinal repair in the setting of HIV enteropathy. The study is published in AIDS 2013, 27:2207-2217. More information about this study can be found at http://files.www.enterahealth.com/about/publications/AIDS_2012_Asmuth_presentation.pdf. HIV-associated enteropathy is a syndrome characterized by chronic diarrhea (greater than one month in duration) without an identified infectious cause after thorough evaluation, in an HIV-positive individual. Patients with HIV suffer immunological and structural defects in the gastrointestinal tract which is thought to be due to direct or indirect effects of HIV-infection of the intestinal epithelium. Enteropathy associated with HIV infection results in pronounced loss of CD4+ T-cells, increased intestinal permeability, and microbial translocation with increased plasma levels of bacterial endotoxin and 16S rRNA, which can promote local and systemic immune activation which is implicated in disease progression. 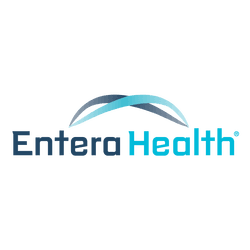 Entera Health, Inc. is focused on improving worldwide health through the development of clinically safe biotherapeutics to address unmet needs. Our passion is to help people thrive through healthier living. Our motivation for conducting basic research, clinical studies, and appropriately educating patients and healthcare providers is driven to meet this goal. Visit them at http://www.enterahealth.com/.